From U.S. Highway 19 Take U.S. 19 to Hudson Avenue. Turn East onto Hudson Avenue. Take right at Fivay Rd.. Regional Medical Center Bayonet Point will be on the Left. Regional Medical Center Bayonet Point has a long and illustrious history of providing the highest level of critical care for our community. Founded in 1981, it was the first hospital to be built in northwest Pasco County serving residents in Pasco, Hernando, and Citrus Counties. Regional Medical Center Bayonet Point has more than 350 physicians, 1,264 employees and 500 volunteers on our integrated healthcare delivery team. RMCBP was the first hospital to offer the area a comprehensive open heart program. This program has grown in both scope and concentration of service. 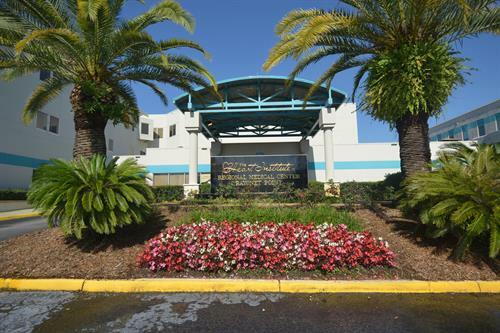 Today the medical staff of the Heart Institute of Regional Medical Center Bayonet Point includes over 30 cardiologists, cardiovascular surgeons, and electrophysiologists. Regional Medical Center Bayonet Point’s reputation for providing compassionate and innovative care to those in need has resulted in the Florida Department of Health awarding our hospital full Level II Trauma Center designation. Regional Medical Center Bayonet Point is the only trauma center in Pasco, Hernando and Citrus Counties. The development of a trauma center was a natural step in the evolution of Regional Medical Center Bayonet Point and is a very proud milestone for the hospital. It is part of the HCA Florida and USF health agreements for trauma care, which supports local needs for trauma services through an affiliation with a major academic university and medical school. Take Veterans Expressway (589) north when leaving airport. Veterans Expressway will merge with Suncoast Parkway.
. Regional Medical Center Bayonet Point is approximately two miles north of SR 52. Turn right on Hudson Avenue.